Jin Air, the LCC associated with Korean Air, has become the first active LCC in North Asia to have a widebody operation. Jin Air has commenced 777-200 flights between Seoul Incheon and Guam. Its initial single 777 will be joined by two more in 2015, at which point Jin Air will look to add destinations such as Hawaii. The low-density configuration with generous luggage allowance and snacks included indicate Jin Air is less aggressive than the likes of AirAsia X and Scoot, although Korean consumers have signalled they want a higher standard of carrier. Jin Air hopes the 777 project will see it overtake Korea's largest LCC, independently-owned Jeju Air. Jeju has responded by considering its own long-haul operation as it builds to a fleet of 40 737s as early as 2018; it has 17 737s in Dec-2014. An IPO for as early as May-2015 will see around 20% of the company floated and cash used to fund expansion and IT infrastructure developments. 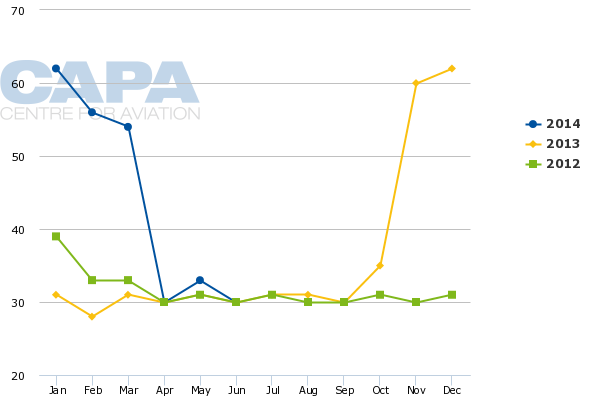 This is a considerable amount of activity in Korea, which has been a sleepy market for LCCs. Jin Air is the first active LCC with widebody aircraft. Jin Air received its first 777-200 on 01-Dec-2014 and two weeks later placed it into service on the Seoul Incheon-Guam route. The long-haul LCC concept is mostly in Southeast Asia but stretches to Europe with Norwegian and Brazil with Azul, although Azul is effectively running a full-service offering on a low cost base. North Asia previously saw a widebody long-haul LCC attempt from Oasis Hong Kong, which exited the market. Most recently, flynas has ended its short-lived long-haul flights in order to focus on its core short-haul network. Jin Air announced its widebody operation in Jun-2014, seeing widebodies as a way to grow beyond the regional market, although more than half of passengers on Korean LCCs are domestic. 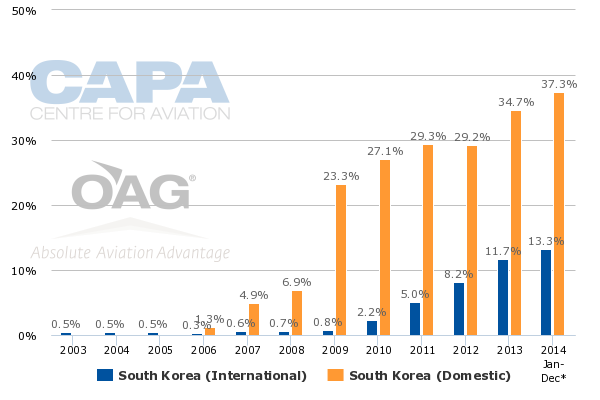 In turn, Korean LCCs account for one-third of the (small) domestic market. They, along with foreign LCCs, account for a smaller but growing share of the international market, although this is somewhat distorted as it includes many long-haul sectors (such as continental North American) where Koreans LCCs do not compete and are unlikely to in the medium term. While China holds enormous potential for Korea and its airlines (Chinese arrivals already account for one-third of visitors to Korea), the bilateral remains constrained with only small expansions (that mainly benefit full service airlines). Charter opportunities have been decreased. Widebody aircraft also provide a way for Jin Air to set itself apart from the competition. Jin Air has been wholly-owned by Korean Air or parent company Hanjn and has played second fiddle to its full service sister, the largest in Korea. Consequently in recent years Asiana's part-owned LCC Air Busan and independent LCC Jeju Air have been bigger. Jin Air is accelerating growth. Since its first flight in 2008, Jin Air has added one or two 737s every year. In Jun-2014 it planned to double its fleet by the end of 2015 from the 11 737s it had in Jun-2014. 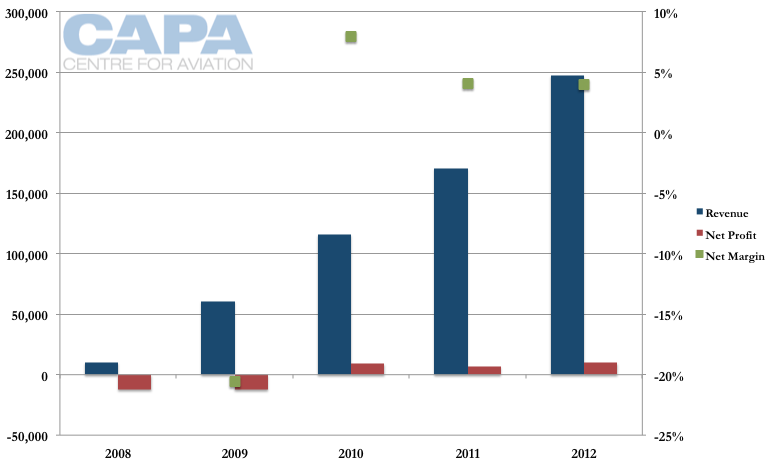 In Dec-2014 this was scaled back to 19 aircraft by the end of 2019. This still represents fast growth and Jin's largest yet. But getting to 22 aircraft was too ambitious. Jin Air does not have experience growing that fast, and such rapid growth would have created initial over-capacity. Even by growing from 13 aircraft to 19, Jin Air may create over-capacity in the short term. It will go on a learning curve to add six aircraft in one year, including effectively introducing a second type – and a widebody at that. It took Jin Air about three years to achieve a fleet of six aircraft. Now it will add that many in one year. Jin Air as of 15-Dec-2014 has 13 aircraft, including its first 777-200. Jin Air plans to take two more 777-200s in 2015, bringing the fleet to 15. To get to its planned 19 aircraft, this implies Jin Air taking four more 737s in 2015, more 737s than it has inducted in a single year in the past. Jin Air's widebody project started on the Seoul Incheon-Guam route on 12-Dec-2014. 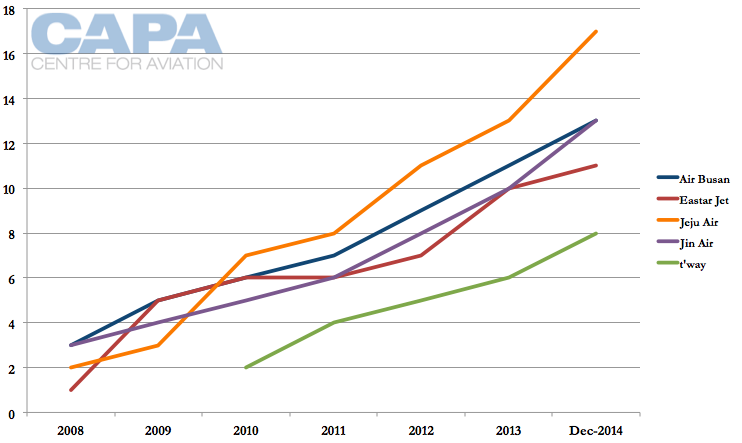 Nine weekly flights build to 12 weekly in Jan-2015 (with a few 737-800 services). Feb-2015 sees 12 weekly 777 services on the route while Mar-2015 sees daily 777 and two weekly 737-800s. The start of the northern summer season sees only daily 777 service. In colder months Guam is a popular destination for its warmer weather. In the 2013/2014 peak from Nov-2013 to Mar-2014, Jin Air operated about double daily 737-800 service on the Seoul Incheon-Guam route. The 777 allows Jin Air to offer previous peak season capacity on one flight. The only other LCC on the route, Jeju Air, will operate double daily 737-800 flights. But given the route's leisure nature and almost entirely ex-Korea nature, it is unclear whether multiple frequencies are an advantage. However, Jin Air will not initially have the same scale on its 777 fleet as the 737 fleet. Further, Guam may be an interim route as the five hour flight hardly makes use of the 777's range and Guam is not a constrained market. Jin Air said reasons to acquire widebodies include flying longer than it could with 737s (such as further into Southeast Asia or new markets like Hawaii), or deploying the aircraft on constrained markets (like Hong Kong) where frequency growth may not be an option. Jeju Air's website shows it continuing to offer double daily 737-800 services after Mar-2015, meaning it will have slightly more capacity than Jin Air's daily 777. Jeju intends to link Guam with Busan from Jan-2015, and Jeju also serves Saipan, another Pacific island destination. Jin Air does not serve Saipan. As of Dec-2014 Jin Air has not outlined further network plans for its 777 but said it could commence Hawaii service in northern summer 2015 although it would want to wait until it has three of the type, reports have said. Australia and Europe have been mooted. Jin Air's 777-200 is fitted with 319 economy seats and 36 "Jini Plus" seats that are regular economy seats with 6" more legroom. Jin Air is opting for a nine abreast configuration in 2-5-2. That is different from the 3-3-3 configuration Korean Air uses on its 777-200s. Jin Air's first 777 was manufactured in 2006 and previously flew with Korean Air, according to CAPA's Fleet Database. Jin Air's nine abreast configuration stands out. Scoot and NokScoot, the only other long-haul LCCs using 777s, have opted for 10-abreast economy cabins – as have most new 777 operators. 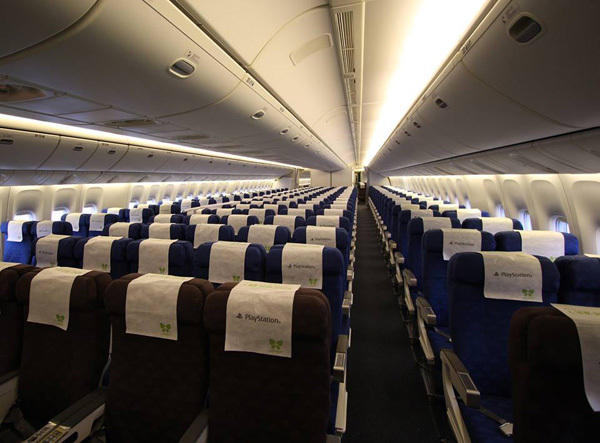 Jin Air's total configuration of 355 seats is less than AirAsia X's 377 seats on the A330-300, a smaller aircraft. Jin Air's 777 will have more seats than other LCC operators like Jetstar or Norwegian, but those airlines use smaller aircraft. If the cabin is comfortable, so too are the fare conditions. Jin Air's lowest fare for Guam includes two 20kg pieces of checked luggage and some ticket flexibility (with fees). Water and lights meals are served while alcoholic beverages and snacks can be purchased for sums that are admittedly modest for a captive environment. A spot check on fares for travel in early 2015 shows Jin Air typically offering the lowest priced ticket, often by some margin. There is comfortably a market in Asia and beyond for Korean carriers to serve with low-cost long-haul flights. The challenge is to make it work. Scoot has found the 777-200 to be too large, although Jin Air may be able to acquire such aircraft at favourable rates from Korean Air. Korean carriers have struggled to form a workable LCC identity. As Ms Cho says "Koreans say they want a LCC" but do not want the limited service that entails. Korean LCCs have become hybrid operations, although this appears to have worked in limited scale. On a long-haul platform any missed cost-saving opportunities take on great proportions. Jeju Air is preparing for an IPO as early as May-2015. Proceeds from up to 20% of the company would be used to fund expansion and IT infrastructure. Jeju Air wants to remain independent. Jeju Air planned to grow to 17 aircraft in 2014 (which it has realised) and 21 aircraft in 2015. In Nov-2014, Jeju Air told Bloomberg it wanted to achieve a fleet of 40 aircraft by around 2018 – a massive development. In 2018 Jeju expects to have KRW1 trillion (USD925 million) of sales. Some of these aircraft could be used by Jeju Air to develop a long-haul strategy, indicating the influence Jin Air has already had. Air Busan has also said it is studying long-haul flights. Outside of Korea, Spring Airlines – and other LCCs – are weighing up long-haul flights. Jin Air will be the first but not last widebody LCC operator in North Asia, although a sustainable model may take some time to emerge. In 2013 Korean Air has moved Jin Air out of the airline company and into Hanjin KAL. As a result financial figures are unavailable, but prior to this Jin Air had low single digit margins. Jin Air's 777 build-up will be slow, depriving it of scale, even if it can lean on sister carrier Korean Air for support. The low density configuration and limited low-cost initiatives place a risk the 777s could become stronger for marketing than practicality. It is early days and stronger routes could emerge. Even in a competitive marketplace, Jin Air – and other Korean LCCs – could carve a niche as consumers remain loyal to local carries. The Korean market faces the vexing question of whether the tail wags the dog or the other way around: LCCs are hesitant to cut costs (and product delivery) further as that would make the airline less attractive to consumers, who in turn think this "Korean-style" LCC product can continue for longer. There have been small changes – such as removing some snack boxes – but these are still scratching at the surface. Besides Jin Air and Jeju Air, Korean Air's main competitor Asiana is considering establishing an LCC to be based in Seoul, where Air Busan is not participating in the popular market. EastarJet and T'way remain small after bouts of coming close to exiting the market. Arguably the existence of five LCCs and possibly a sixth is excessive, particularly with publicly announced aspirations by foreign airlines like AirAsia to establish a local subsidiary JV. Some consolidation among airlines in Korea may be a favourable outcome. A lower cost base will make Korea's LCCs more competitive internationally, allowing them to benefit from the inbound interest in Korea. As regional liberalisation improves (North Asia will not have European-style liberalisation for some time), Korea's LCCs will have even more opportunities than today.